CHICAGO — Academic and research librarians and libraries are essential to a thriving global community of learners and scholars. As students, faculty, and staff change the way they consume information, academic libraries are also transforming to ensure success across the higher education community. More than 3,000 academic and research librarians and library workers will gather April 10-13 in Cleveland to discuss the many ways that library professionals are re-inventing themselves to stay on the cutting edge. CHICAGO — Today, the Public Library Association (PLA) officially opened the Call for Proposals for educational sessions to be presented at its next biennial conference, to be held Feb. 25-29, 2020 in Nashville, Tenn. The PLA 2020 Conference will highlight innovative work and ideas that address the core challenges facing public libraries and their communities today. CHICAGO -- Planning to attend the American Library Association's (ALA) 2019 Midwinter Meeting in Seattle, Wash.? Be sure to take advantage of the outstanding programming offered by the Public Library Association (PLA). CHICAGO – The American Association of School Librarians (AASL) has issued an open call for author panelists to take part in concurrent sessions during its 2019 National Conference & Exhibition. The conference will take place Nov. 14-16, 2019, in Louisville, Kentucky, with concurrent sessions being held on Friday, Nov. 15, and Saturday, Nov. 16. More information is available at www.ala.org/aasl/authors. CHICAGO -- The Public Library Association (PLA) has added a new publication to its collection of resources that are available free of charge to all PLA personal members in good standing. 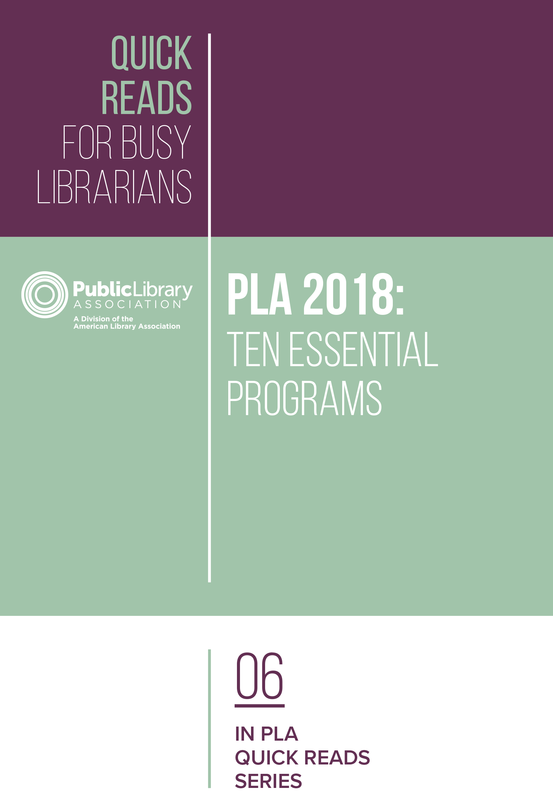 PLA 2018: Ten Essential Programs is the sixth installment in the Association’s “Quick Reads for Busy Librarians” series.